A photo invitation perfect for any milestone, this vintage invitation design is expecially designed for your mum, dad, grandma or grandfather. A textured chocolate brown background is backdrop to two photographs of the guest of honor - one taken from his childhood and they other, a more current picture. 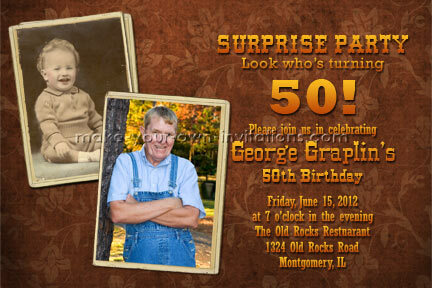 Fill in the party wording details with your own party information and send us through two photos of their younger and older years. Alternatively you can choose to feature one photo instead. This invitation available as a "print it yourself" 4"x6" or 5"x7" .JPeg file.